Hi friends. Two pieces in my Idea Furniture Collection were on display last week at a reception at On The Purple Couch in DC, one of Annie Sloan’s stockists here in the US. What a warm reception I received by the owner, Bahia, and from those who attended. It was a lovely experience. After posting these shots in Instagram, Annie Sloan and I had a wonderful short conversation about them. Bahia contacted me a few weeks ago and asked that I design and paint two pieces exclusively using Annie Sloan Chalk paint and wax. I had used her paint in the past on many pieces but never on my modern furniture. I was up for the challenge and appreciated the opportunity! Thanks Bahia! I’m exploring the deconstruction of letterforms on a 3:4 grid, the letters V and Y are merged and placed in an asymmetrical layout on the front of this mid century dresser. Mid century pieces make for wonderful canvases for this type of design. 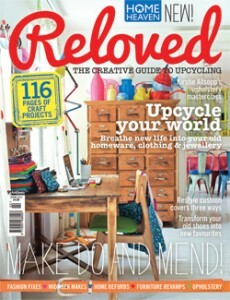 Take a look at my other dresser in this series. This piece was originally designed in the late 1930’s during the art deco period in history where rich color and bold geometric shapes adorned much of the buildings. 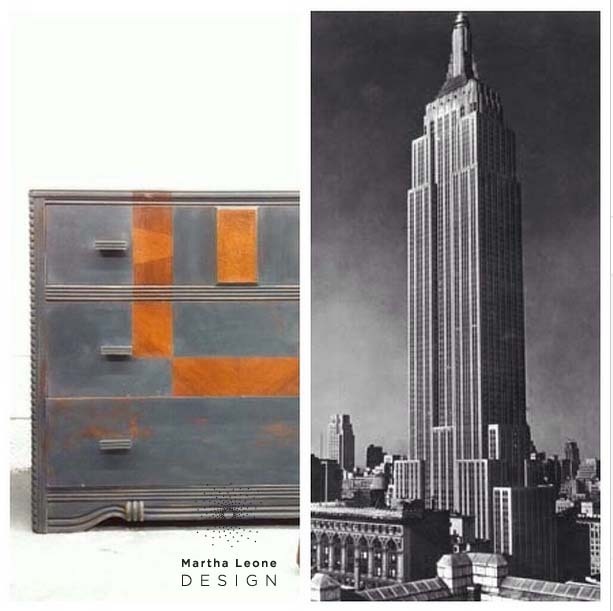 Using history to guide my design, I created a shape that was inspired by the iconic Empire State Building and wrapped it from top to front on this dresser. Mid Century Dresser: With Annie Sloan paint, I use her brushes. But, to get the desired look on the mid century piece, I revised my process by thinning down the paint a bit and by using a 6″ foam roller instead of the brush. The end result was a smooth brushless finish. No sanding was needed. 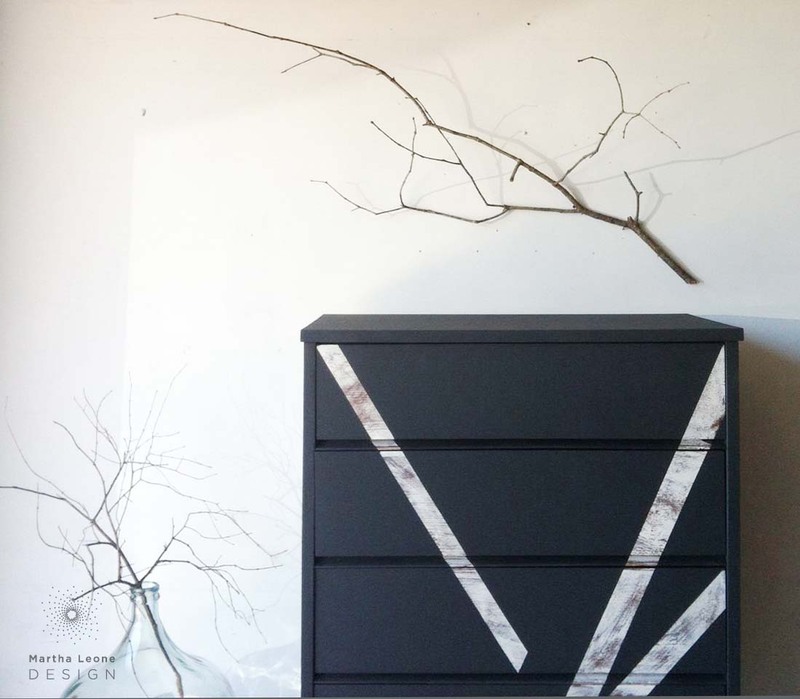 Art Deco Dresser: I wanted this piece to look more textural than the other so I used Annie Sloan’s flat brush and painted in loose strokes. Distressing also helped achieve the desired texture. 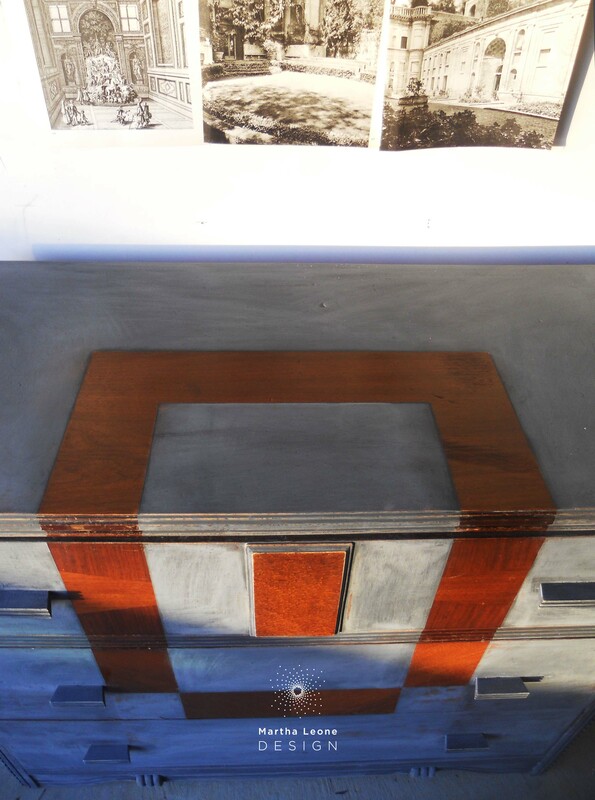 The next three photos show what the Art Deco dresser looked like after painting and sanding but BEFORE wax had been applied. You can see how dramatically the color shifts to a beautiful deep shade AFTER wax has been applied and buffed. I love the texture in the pre-waxed photos and have been looking into ways of maintaining this texture even after wax has been put on. On my Constellation Dresser, I used low grit sandpaper to scratch the surface and used a toothbrush to flick small specs of plaster on the surface. Those have worked but I am still looking for new ideas to get this look. Annie suggested that I wax but not buff. I’ll try that and also try dry brushing varying shades of Graphite/Pure White mixes. After your piece has dried completely, the next step is up to you. 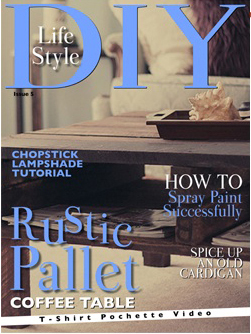 If you want to sand the paint to a distressed or smooth finish, you have two options: 1. Wax first, then sand, then apply final coat of wax. This cuts down on the dust and allows more control over how much paint comes off while sanding. 2. Or, sand first, then wax. The directions below assume the piece has been sanded first. Bahia recommends that you brush the wax on using an Annie Sloan wax brush with a light application. Before the wax dries, wipe off excess using blue shop cloths (they are lint free and can easily be found online or at your local home improvement store). Wait 15-20 minutes and buff to a sheen. **In the case of my mid century piece, Bahia added a second layer of wax one day later and buffed again using the same process. These two pieces are available at On The Purple Couch! 301-896-0011. http://www.onthepurplecouch.com. Or, you can purchase them through my etsy shop. These past few weeks have been full of new opportunities and lots of custom work. I attended The Makers Summit last weekend and came away with ideas for the growth of my business from amazing people like Jodi Levine of Super Make It and author of Candy Aisle Crafts and Rachel Faucett of Handmade Charlotte. One of the highlights was a super talk on the topic on productivity from Eric Dodds/The Iron Yard. He is developing a series of blog posts with the content from this talk. I highly recommend it. 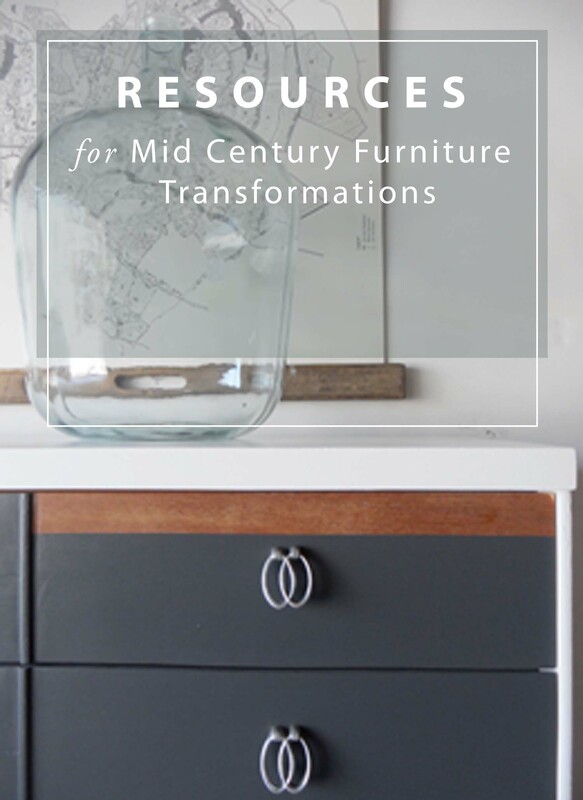 Mid century custom pieces have become a staple of my business. I have detailed my process and materials list in two posts. This latest piece was done for a young girl with lots of sophisticated style since a clean slick mid century piece was exactly what her redecorated bedroom needed! I’ve been in serious production mode since Thanksgiving, trying to finish the custom orders for 2014. Yikes. It’s been busy. Today, I’m sharing two wonderfully constructed pieces, both painted similar shades of gray. The long dresser is available in my etsy shop and the other piece was a custom order. After a bit of clean up and light sanding, I mixed a custom gray color with plaster of paris mixture then proceeded to paint both two coats of gray. They were distressed then sealed with Minwax Wipe-On Polyurethane. 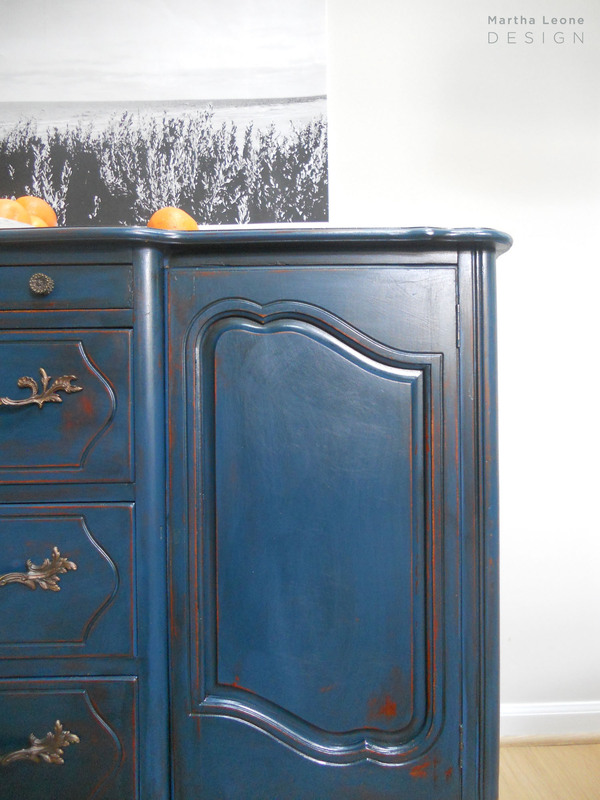 The long dresser was first painted a lighter shade, then topped off with the charcoal color. These dressers always provide a nice break from the mid century pieces that need far more prep and care. 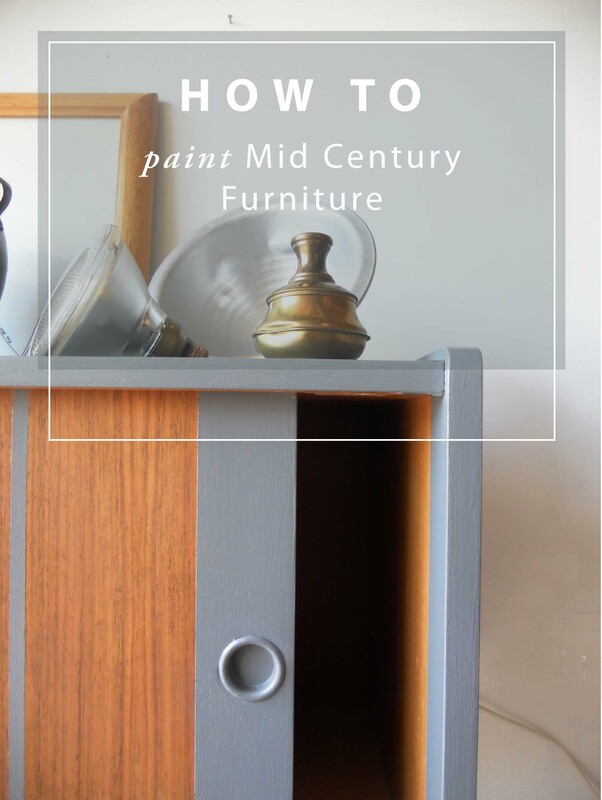 I’ve written many posts that detail how I prep and paint my mid century furniture. Or, peruse the MID CENTURY PORTFOLIO where any image will take you to a post. One can of paint, two paint techniques. 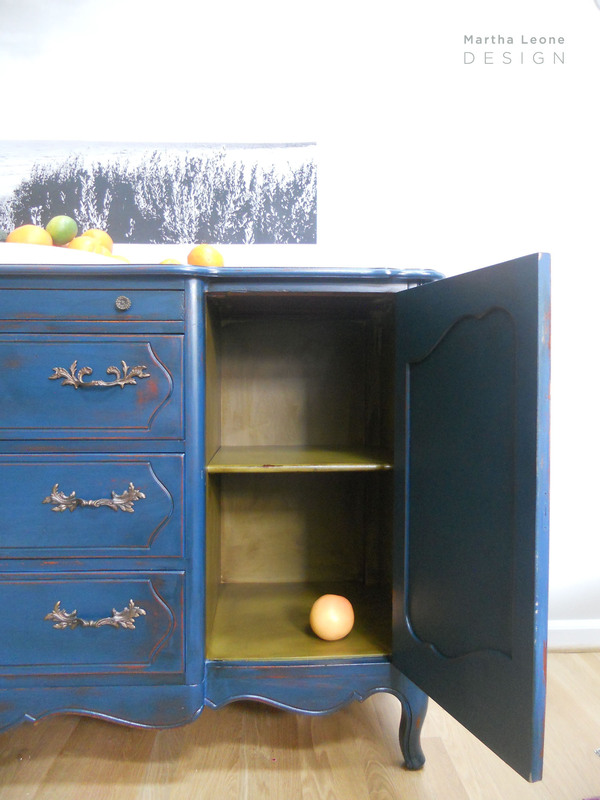 This piece is old so I knew the homemade chalk paint would adhere well to it. Cleaned the piece with a rag. Mixed small batch of homemade chalk paint. Painted two coats then distressed. Sealed with polyacrylic although wax would have been a great sealer. Painted the antique drawer pull and installed. This piece needed a glossy finish with minimal distressing. Cleaned and sanded by hand. Primed with an oil based tinted Benjamin Moore primer. Used a 6″ roller. Painted two coats with a 6″ foam roller. Lightly distressed along the edges. Used a staining pad to seal with Minwax Wipe-On Poly. For best results, I used staining pads to apply the wipe-on poly and 6″ foam rollers to cover flat surfaces when brush marks aren’t intended. Follow me on Instagram as I’ll be sharing more process shots in the coming weeks! The long dresser had been previously painted by someone else and my customer bought it with the intention of having it repainted by me. In order to prepare it for the new paint, I stripped the top and sanded the entire piece. Here’s a list of problems I noticed in the green/yellow paint job and suggested remedies. Feel free to add to my suggestions! It’s great to learn from fellow painters! Problem: Paint was applied on the inside and outside of the dresser frame and to the drawers’ edges. Remedy: Don’t do this unless absolutely necessary! I’ve found that many drawers in dressers built during the mid 1940s-1970s slide into their dresser frame without much wiggle room. So painting the sides and top edges of drawer fronts can be tricky and cause sticking, etc. If I paint those parts, I tend to paint in very thin layers or not at all. Problem: The green/yellow paint didn’t cure although the piece had been painted weeks before I received it. Remedy: Oh my goodness people, we really need to take care to properly prep our pieces. I’m guilty of taking short cuts in the past and they almost never pay off. I sand almost every piece I paint, even if I’m using Annie Sloan Chalk Paint although her paint is amazing and doesn’t really need that extra step. This is one of those monstrous pieces that we don’t attempt to bring inside for proper styling and photographing. It’s a monster… but a good looking one. This type of furniture isn’t my style but I can appreciate its construction and quality. It’s a Drexel and has been painted in two of my all-time favorite color combinations. I’ve always believed that the larger the piece, the more neutral it should be. I hand sanded the piece then primed it with a water based gray-tinted primer. This preparation is necessary when you’re going to paint a piece with latex paint (as opposed to chalk or milk paint). Ultimately, this step wasn’t necessary as I changed my mind after priming. Instead of using latex paint only, I made a batch of black and white homemade chalk paint. After two coats, it was sanded and sealed with Varathane water-based polyurethane in satin and sold soon after. These are a few vignettes of our house. Brackets for the shelf on the kitchen back wall were purchased from Design2Create. The reclaimed piece of wood was purchased at Second Chance in Baltimore, MD. Photographs were taken by Rebecca with RCA Colors. The white area underneath the shelf will eventually be tiled. I painted this platter from Ikea black and white. – Taped off the areas that are to be left unpainted. Notice the horizontal pieces of tape. That’s the reminder to self NOT to paint them! – Lightly sanded the entire piece except for the taped off areas of front panels. – Primed with Kilz tinted water-based primer. – Painted three coats of Sherwinn Williams All-Surface water-based enamel and quickly discovered that this paint would not work (see product review below). – Shifted to Benjamin Moore Aura paint in satin and after one coat, the desired result was achieved. – Sealed the top with Minwax Wipe-On Polyurethane in satin. For mid-century pieces with tight-fitting drawers and cabinet doors, I’ve learned to tape off the edges and never paint them. If painted, they will scrape against surfaces and eventually stick or the painted surface will get scratched over time. Better to go clean by using tape on every edge. I use Benjamin Moore Advance and Aura paints exclusively for mid-century pieces because of their consistent performance. The stuff is amazing. However, Sherwinn Williams has been trying to get me to use their paints and I’ve read good product reviews by other painters so after my client speced a SW color, I decided to try it. I purchased their All Purpose water-based Enamel. Due to the dark color choice, that paint was recommended. After three coats, I wasn’t getting the opacity that I wanted and came to realize this particular product would not achieve the desired result. I’m sure other SW products are great but would never recommend the All-Surface Enamel. This design mimics the concept in this piece. Design options were drawn for the client using Adobe Illustrator. -Hand sanded the entire piece. -Primed with two coats of Kilz water based primer that was tinted a gray to match the metallic silver. -Painted up to three or four coats of Martha Stewart Metallic Polished Silver paint with a 6 inch roller. I worked with a roller and 2 inch paint brush to get a smooth finish on the top. After rolling the paint on, I quickly ran the brush from left to right in straight lines to eliminate bubbles. -Spray painted the hardware with black. -Sealed the entire piece with two coats of Minwax Wipe-On Polyurethane. Touch up was a nightmare. I’m not sure why but there is something about the properties of metallic silver that didn’t work for touch up. All touched up areas looked chalky and didn’t have metallic sheen. I ensured that the paint was mixed well and that I was using the same container for touch-up that I used to paint the entire piece. My advice, based on my experience, is not to touch up. Introducing the sister piece to the mid-century cabinet I shared last week. This post follows the same format as my last post where I detail my process and more importantly, lessons learned from trial and error. – Sanded the entire piece: Outer frame was sanded down with an orbital sander down to the raw veneer. Drawer fronts were hand sanded to roughen up the original finish. – Applied three coats of Kilz primer. – Painted the outer frame four coats of Benjamin Moore Aura Satin in Super White then sealed it with two coats of Howard’s Citrus Shield Paste Wax. – Painted the drawer fronts Behr Ashwood in Satin then sealed them with Minwax Wipe-On Polyurethane . – Used a roller for large flat surfaces and a good quality brush for other surfaces. I already suspected that this veneer would not look good after struggling with the other piece. But I was determined to avoid covering up those cool peg details with paint. I wanted one of these two pieces to boast a beautiful wood finish. I thought that if I use a dark stain on the veneer, the blotchy spots would disappear. Not so. The dark stain only accentuated them! I chose to paint it although I’ve heard of techniques to help the wood take the stain more consistently. Some of these include water popping the grain by using 50:50 very hot water and denatured alcohol; using wood conditioner (doesn’t always work for me); or bleaching the veneer. This great American of Martinsville cabinet will be for sale soon at Peg Leg Vintage (contact them for availability: peglegvintage@gmail.com, peglegvintage.com).